Club Penguin Cheats by Mimo777 Club Penguin Cheats by Mimo777: Club Penguin New Home Page & Start Up Screens! Club Penguin has a new home page for the new Temple of Fruit Adventure Party! You really have to check out the animation on this one! 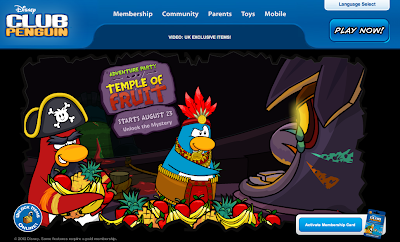 The Temple of Fruit starts August 23! What are you most looking forward to about this party!? I love those at partys!!!! in the animation at the home page the penguin ran past three totems that spat seeds. maybe that means it will be some kind of quest to get to the cursed totem. p.s. my penguin name is Bro Bro Joe, please add me mimo!!!! I ❤ costumes,espesaly free items.